From 1991: The British edition of THE AUTOBIOGRAPHY OF SPECIAL AGENT DALE COOPER: MY LIFE , MY TAPES spun off from TWIN PEAKS. This was the second, and I suspect less well read, paperback spin-off from the show after Laura's diary. I read this (and the other books) back at the time and, if I remember correctly, this acts as a prequel to the TV show (ending as Cooper sets out for Twin Peaks to investigate Laura's murder) and filling in some of the Windom Earle back story from the latter part of the second season. 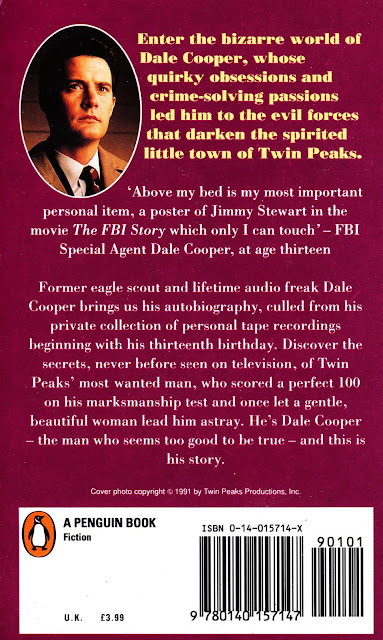 I don't remember if there were any significant contradictions with the episodes themselves but, although many films and TV shows like to claim that their off-air fiction dovetails with the overall continuity, these books tried harder than most. 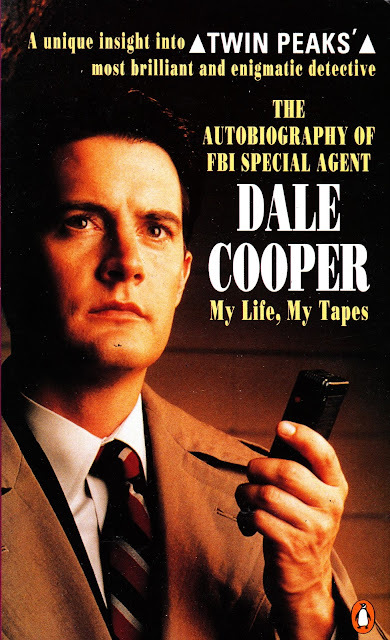 There was also an audio tape released that purported to be Cooper's dispatches to the unseen 'Diane' covering season one and the opener of season two. This book and that tape dovetailed nicely together. There was also a fictional travel guide to the town that, again, incorporated and expended on aspects of the show. Laura's diary has been re-released in anticipation of the return of the TV show but the other books haven't, as yet, been reprinted.